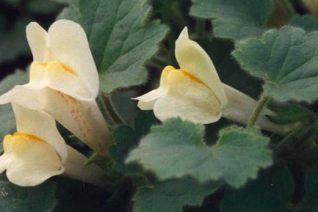 Soft looking creeping perennial for rich, well drained soils in light shade. Large furry leaves consort beautifully with the pale yellow snapdragon shaped flowers on this 6″ x 1′ wide herbaceous perennial. Excellent in rock gardens, containers with protection from the hottest sun. LOVES cultivation in rich, well drained soils. Admirably long lived container perennial that is also very long blooming June to frost. Regular summer water. Completely winter deciduous.